The purpose of treating effluent before it is discharged is to protect the natural environment except in those cases where the aim is to re-use this water (see wastewater re-use). Gradually, regulations have distinguished between potential discharge levels in order to adjust them to quality targets set by the competent authorities. For instance, the European Directive of the 21st May 1991 on urban wastewater treatment (n° 91/271/CEE) identified three types of area according to the receiving medium: normal areas, areas that are sensitive to eutrophication and less sensitive areas, each of these areas is subject to differing discharge levels. When this text was transposed into French law (order of the 22nd December 1994), it led to the application of general rules on compliance summarised in table 35. Notwithstanding, given the local quality targets that allow for preferential usage of river water in downstream reaches (fishing, swimming, drinking water supply), local authorities can "tighten up on European recommendations". As a rule, these local standards are the result of development plans (see French SAGE or SDAGE…). 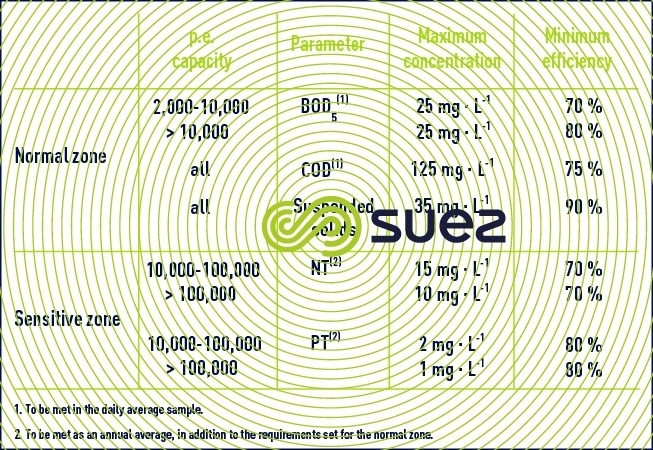 In order to allow for the random nature of hydrological river variations, these quality targets will be deemed conform, within the limits of the reference flow, when the annual number of non-compliant (with regard to both concentration thresholds and to efficiency) daily samples does not exceed a set number based on the number of samples taken yearly. However, no sample may exceed a fixed threshold for the BOD5, COD and suspended solids parameters (respectively 50, 250 and 85 mg·L–1). These rules on acceptable margins must be compared to the "percentile" concept routinely applied in the United Kingdom. For instance, a 95 %-ile limit means that the discharge standard must be checked in at least 95% of samples taken. With regard to discharging into estuaries or into the sea, the discharge conditions applied allow for activities specific to the coastal area affected (tourism, swimming, shellfish farms).